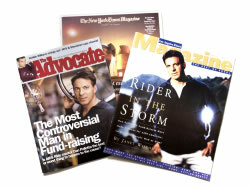 Dan Pallotta is the founder of Pallotta TeamWorks, which created the multi-day, four-figure pledge minimum charitable fundraising event category. The company created the AIDSRides, the AIDS Vaccine Rides, the African AIDS Trek, the original Breast Cancer 3-Day walks, and the original Out of the Darkness suicide prevention overnight event. These events grossed $556 million in donor contributions and netted $305 million for charity after all expenses in nine years. More than 182,000 people walked or rode in one of the events.The company was the subject of a 2002 Harvard Business School case study. Pallotta TeamWorks' ideas and methods have been been adopted by dozens of other events, charities, and event production companies in the U.S., U.K. and Canada, which now raise tens of millions of dollars each year for important causes. Dan graduated from Harvard University in 1983, where he created Ride for Life - a transcontinental bike ride in which he and 38 of his classmates rode 4,256 miles from Seattle to Boston to raise money and awareness for Oxfam-America. Dan is the Author of When Your Moment Comes (Jodere, 2001) and Uncharitable (Tufts University Press/University press of New England, 2008). He has been awarded the Creative Vision Award by the Liberty Hill Foundation (1998), the International Citizen of the Year Award by Albany State University (2008) and the Humanitarian of the Year Award by Triangle (2006). Dan lives in Los Angeles with his partner and their three children.